Community Weaving: Is this the new face of activism – as the Ocean Beach Entryway clean-up showed? Is activism dying out in America? According to a recent OB RAG article which revisited the Occupy movement one year later, the Occupiers may no longer have their tents staked to the ground downtown, but they have returned home or are looking for jobs while continuing the movement. Since activists are a wide ranging bunch, is this now the state of activism in America? Have more activists simply decided to be active from their own homes? While there is a case to be made for this, a recent gathering of OBcean activists at the OB Entryway proves people are still willing to show up and take a public stand. 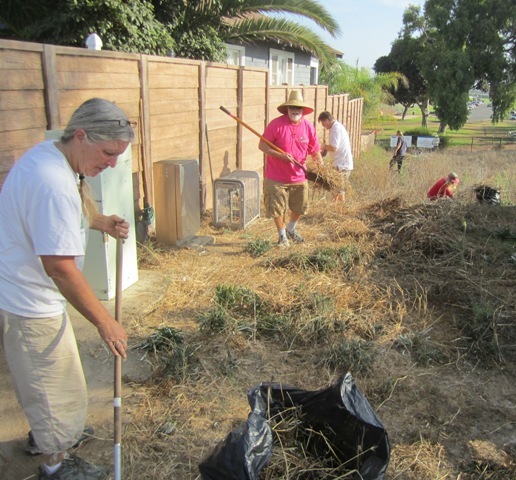 About 20 people signed up to attend the OB Entryway cleanup which was held last Saturday, September 8. Thanks to an amazing turn out and subsequent efforts, a job which was estimated to require a minimum of four hours was completed in about half the time. So, the answer to the initial question is “no”. In fact, some argue how activists are far more motivated to enlist in efforts to fight a common cause rather than join another committee or attend another council meeting – only to learn their voice is drowned out and their vote lost amidst the noise of cronyism. Activism must not be dying out, as some have questioned. Rather, it is on the rise. But clean up’s and Occupy movements are only the beginning, and the body of activists have morphed right along with the advance of Internet technology and social media. No longer do actions require multitudes of people standing on street corners and outside office buildings displaying hand made signs, raising awareness and chanting slogans to abolish unfair or unsound practices. Today, the tools of activists are less visible to the casual observations of certain people and demographics. Activists are more likely to utilize Facebook pages and websites for announcements and forums, as well as tweets and text-storms to coordinate activities between and during actions. Of the numerous examples where on-line activists have recently had a real and positive impact for their causes, each case demonstrates there are massive numbers of activists waiting in the virtual wings of cyberspace to show their support for a good cause. Again, there have been many successes in the previous year, alone. When the Komen foundation announced they were no longer supporting Planned Parenthood, hundreds of thousands of signatures were collected in a matter of hours, sending a strong message rivaled only, perhaps, by the support shown for Trayvon Martin. In the former case, within days of the first on-line petitions, Komen got the message, along with those who supported defunding Planned Parenthood. As part of back room dealings, Komen was ultimately forced to reverse itself due to national outburst, as Komen and their strategists undoubtedly feared the power of the people and our ability to amass and organize, and rather quickly, too. In this case, as in many others, the connection and actual timing of events in regards to on-line activism is undeniable and very real, as more and more politicians and their strategists are coming to realize. Still, as with any cause worth fighting, only a sustained effort will permanently defeat the wrongdoing. Often times, at the point of attack the goal is to breach the outer defenses, exposing the weakness within and to demonstrate the power of the people for those who would otherwise ignore our individual voices. In the process, we’ve seen how coalitions are formed and the ranks are filled with sympathizers and others who struggle against intolerance and ignorance. Of course, taking a public stand is still very important. For example, as the San Diego World Beat Center has been fighting to keep their doors open as part of a decades long struggle to obtain a proper lease for their Balboa facility, the biggest impact we can have to support their efforts is often showing up on-site or by addressing the city council to protest systematic abuses. A public demonstration still has real value, namely when people go outside en masse, and we meet up with other likeminded individuals. But it’s more than a gathering or the outcome of any single event. During the OB Entryway clean up, volunteers grabbed their shovels and rakes and together they made a real difference, as evidenced by the mountain of shrubs which filled the center of the Entryway grounds. What only took a few hours to complete, the grass roots once again let their voices be heard, and shared this experience with many others driving, riding and walking by the volunteers that day. They were raising awareness, recruiting new members to the cause, exercising our rights as citizens and, perhaps most importantly, serving notice that OB is not to be ignored. What’s that new and popular slogan? Respect OB. After spending almost one-half million dollars to put up “We did it!” signs, the city promptly allowed the entryway to grow into a weed strewn mess. Several people feel such premature celebrations are far too commonplace among politicians, and too similar to one proclamation of “Mission Accomplished” to politicize the moment when, in fact, thousands of American men and woman were still in harms way and would soon be killed in action. And so the OB Entryway clean up was conducted for these, and other reasons of protest. While such camaraderie and community organizing is not unique to grass roots efforts, and OBceans have formed many such collectives, this particular action may reflect the new state of activism in America, which I would begin to refer to as Community Weaving or CW. As a weaver, the basic principles are to organize and coordinate communities and their resources which can be shared among all members. In the case of the clean up, a thoughtful, carefully prescribed approach to cleaning up our open spaces was presented by the organizers, and this nonviolent direct action was well-provisioned by a host of people and organizations. Despite the false claims of naysayers, this public demonstration accomplished both short and long term goals, namely the clean up of weeds and shrubs, uncovering of native and non-native plant species, and the mobilization of our nations most important asset: People. Supporting this public display of force were a variety of OB businesses and community leaders, and this is where CW comes center-stage. Just as an ole’ fashioned barn raising would have done, the clean up effort was successful only because the community of sharing: shovels, rakes and trash bags were donated by Dog Beach DogWash, refreshments by Body Brew’s Brenda McFarlane, shade was made available, along with signage from OBRAG.org, and restrooms were provided by The Green Store. Though we weren’t raising a barn on this day – it was more like we were raising a little hell in protest of our forsaken community entry – our clean up proved, again, how OBceans continue to rise up for action when called upon, and our community talent pool, along with our resources, is growing and thriving along with the changing times. to all the volunteers who did such a wonderful job for the neighborhood.